The Accu-Chek Active test strips are part of a system designed for people on the go. With a tiny blood sample, the fast five-second test allows people with diabetes to get quick and accurate results. Touchable test strips with capillary action require a very small blood sample (1 microliter). You can apply blood to the test strip in or out of the meter. Choose what works best for you. Test your blood sugar from your palm, forearm, upper arm, thigh, or calf. Supply box of 50 or 100 available. Easy To Use. Accurate. Compact. Reliable. Painless. Reliable. Easy To Use. Compact. super easy to use. 1st time meter user for Gestational Diabetes... Highly Recommended. 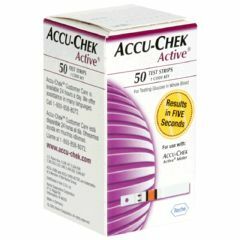 Which meter is to be used with Accu-Check Active test strips? Does the test stripes come in individual tear-open packets, or do they come in large tubs?